Looking to create a new experience in a room that you’ve lived in and enjoyed for years? Instead of going to a “big box store” and selecting a “some assembly required” product like so many others have done, consider Michael David Cabinetry and Design, LLC. We can work with you to design, build and install a custom entertainment center or library shelving system. Looking for a desk that makes a statement? At Michael David Cabinetry and Design, LLC we’ve built several custom professional desks that a both functional and elegant. Large or small, home office furniture, built-in’s , entertainment centers, mudroom cabinet, furniture… challenge us with your project needs and we will impress you with our skills and attention to detail. 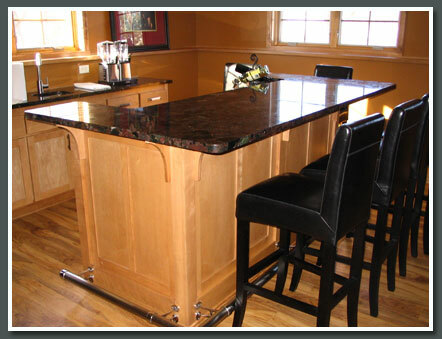 Looking for a truly custom bar for your basement? Make your basement a little more interesting with a custom bar and stools to create another gathering spot for your friend and family.